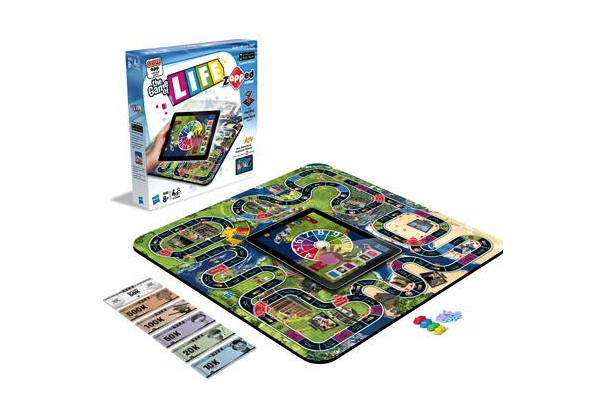 The Game of Life zAPPed is available in stores now. Instead of being represented by tiny, featureless pink and blue pegs, players can completely customize their virtual pegs, adding hair, hats and other accessories. The iPad is also used to play a series of mini-games that have been integrated into the main game, as well as serving as the spinner, complete with an authentic tick-tick-ticking sound. Hasbro additionally partnered with America's Funniest Videos to bring life stage appropriate videos to the game. With Battleship zAPPed, you place the battleships onto the surface of an iPad. Special conductive paint on the battleships will allow the iPad to track their positions (Monopoly zAPPed uses a simiular technology to differentiate the debit cards).